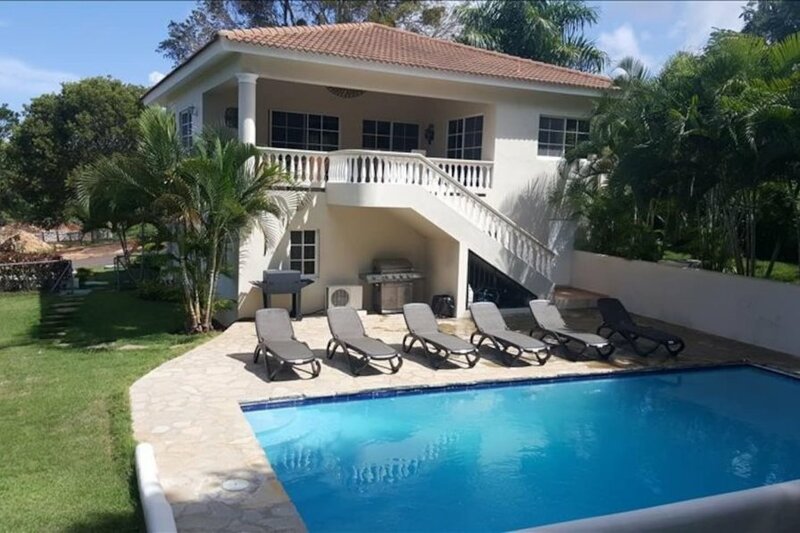 Sosua Vacation Villa Rental Near Everything! Confortable 4 bedroom ocean view villa in gated community only 5 walking distance to downtown sosua and sosua beach. Enjoy living the wonderful laidback vacation life with not a care in the world or a problem in sight. One of our finest vacation villas, it has four bedrooms and three bathrooms. There?s plenty of room for you to bring along your closest friends or family members. Featuring a master bedroom that has its own private balcony leading out poolside, the home has a spacious open living area with comfortable couches and plenty of dining space for yourself and guests. Enjoy cooking in a recently renovated kitchen filled with top notch appliances and tools all top chefs need to make delicious meals. Stay cool as each bedroom has air conditioning for the hottest days. A maid service comes daily to tidy up the home and make the beds for the night. All of the amenities and features of a top resort are included without the over crowdedness of resort vacations. Nearby in town enjoy shopping and luxury retailers, horseback riding through the Puerto Plata landscapes, masseuse service by luxurious spa staff and of course hanging out and enjoying the ocean, there will be little to no downtime on your trip. Even try your luck at the casino! We recommend trying our delicious native foods at top rated restaurants downtown just walking distance away from your private Sosua vacation rental home. We look forward to welcoming you into our community and showing you everything that the Dominican Republic has to offer! We hope to see you on the great island soon and look forward to getting to know you and seeing you enjoy paradise. Book today to ensure that your preferred travel time is available and secure.